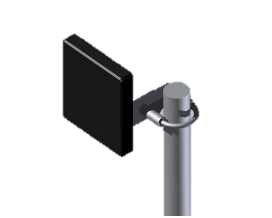 The HDP-10dBi panel antennas are designed to be used in commercial, military, and other applications where reliability is needed most. The antennas are designed to provide maximum Data, Video & Voice performance in a wide range of applications. The antennas are provided with state-of-theart radiating elements essential for maximum reliability and superior performance. Coax: 195 or RG58 upon request. Overall Dimensions: 6 in. L x 6 in. W x 1.05 in.